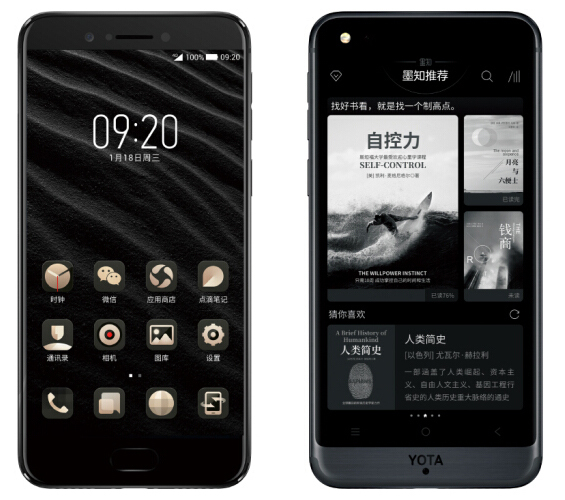 Home Business YotaPhone Has Created The Third Dual-Screen Phone. YotaPhone Has Created The Third Dual-Screen Phone. Remember YotaPhone, the brand that attempted to solve smartphone battery woes by adding a second e-ink screen on its phones’ rear panel? It’s back again with its third smartphone, which brings refreshed hardware and a new design, hoping third time’s the charm. The all-aluminum Yota3 packs a 5.5-inch 1080p AMOLED display on the front, and a 5.2-inch 720p e-ink display on the back. It’s powered by an octa-core Snapdragon 625 processor paired with 4GB RAM and comes with a 12-megapixel primary camera, as well as a 3,300mAh battery that quick charges via a USB-C port. There’s also a dual-SIM slot that lets you use one of them to add extra storage with a microSD card. As Engadget notes, the Yota3 seems a bit expensive at 3,699 yuan (~ $560) for the 64GB model, considering that it’s using a mid-range chip from last year (Xiaomi has phones starting at $150 for the same price – albeit without a second screen). Beyond that, there’s the lack of a dual camera system for Portrait Mode-style shots, which doesn’t seem like too much to ask at this price. I’m also disappointed that the Yota3’s design brings none of the charm and uniqueness of the previous models – especially when compared to the beautifully curvy YotaPhone 2. Instead, the new handset blends right in with all the other rounded rectangles crowding our desks over the past couple of years. Still, the ability to conserve power while checking your email and reading ebooks on the go could make the Yota3 appeal to a small group of phone enthusiasts. Previous articleThe Best Thing About iOS 11 Could Be This Augmented Reality Ruler. England international David Beckham was given a straight red card on Saturday night for a tackle on Seattle Sounders midfielder Peter Vagenas in the 17th minute. PICTURE SPECIAL: David Beckham set to pay the price for MLS red card… £150 that is! I’m writing to make you know what a notable discovery my wife’s daughter developed studying your webblog. She realized lots of things, including how it is like to have a marvelous helping nature to get most people effortlessly know selected grueling subject areas. You actually exceeded my desires. Thank you for offering such invaluable, safe, revealing and cool tips about that topic to Julie. Sharp will launch the largest full-screen smartphone ever! Telenor Pakistan Is Shifting To 4G Network.